"If you do say, 'Yes, my child has seen a counselor or a therapist or a psychologist,' what does the school then do with that?" asks Laura Goodhue, who has a 9-year-old son on the autism spectrum and a 10-year-old son who has seen a psychologist. 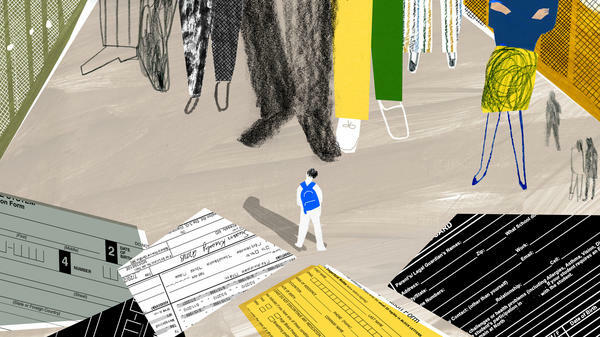 The state's school districts now must ask whether a child has ever been referred for mental health services on registration forms for new students. "If you do say, 'Yes, my child has seen a counselor or a therapist or a psychologist,' what does the school then do with that?" asks Laura Goodhue, who has a 9-year-old son on the autism spectrum and a 10-year-old son who has seen a psychologist. "I think that was my biggest flag. And I actually shared the story with a couple of mom friends of mine and said, 'Can you believe this is actually a thing?'" Goodhue worries that if her children's mental health history becomes part of their school records, it could be held against them. "If my child was on the playground and something happened," she says, "they might think, 'This child has seen mental health services. This must mean something' — more than it really means." The question was largely overlooked until parents started filling out school registration forms this summer. It was five words in a 105-page school safety bill that contained controversial measures like increasing the minimum age to buy a gun, and arming school employees. Parents worry that the information could fall into the wrong hands and may follow children throughout their education, says Alisa LaPolt, executive director of the Florida chapter of the National Alliance on Mental Illness. "In a perfect world, getting treatment for mental health challenges would be no different than getting medical treatment for a skin rash or a bad cold or a broken leg," LaPolt says. But that's not the world we live in right now. There is stigma around mental illness and getting treatment for it." School districts say counselors will use the information to help Florida students get the services they need. Some districts will only share the information with psychologists and administrators. Others say they will provide access to teachers and front office staff as well. School counselors say they understand the stigma surrounding mental illness. Some say the way the law was written doesn't help. The mental health question was grouped with requirements to report arrests or expulsions. "I can certainly understand parents having a reaction when they see those questions, sort of, asked back to back, says Michael Cowley, manager of psychological services for Pinellas County Schools. But in order to help students, Cowley says school officials must first determine who needs mental health services. "The process we're trying to develop and everything we're trying to do is just with an eye toward reducing stigma, increasing awareness and getting students access to more care," Cowley says. The requirement has school districts worried about more than just stigma. The state left implementation of the provision up to local districts. At a meeting in Tampa, Hillsborough County School Board member April Griffin raised the issue of patient privacy and a federal law that protects it, known as HIPAA. "I could foresee some lawsuits around this," Griffin said. Still, counselors say more parents may support the law once they start to see children getting the counseling they need. The school safety law provides nearly $70 million dollars to increase access to mental health services in schools. National experts say the money is long overdue. Florida has historically been among the worst states in terms of providing money for mental health care, says Ron Honberg, senior policy adviser for the National Alliance on Mental Health. "We know that the symptoms of mental health conditions and serious mental illnesses in particular tend to surface during the teen years and early 20s," Honberg says. "And that's a time when we should be putting the most resources into interventions." In Broward County, where Parkland is located, the district is using part of the $6 million it received to hire 50 staff members — many of them counselors, psychologists and social workers. Their ability to reach students in need could depend on whether parents feel comfortable checking "yes" on a registration form. This story is part of NPR's reporting partnership with WUSF and Kaiser Health News, which is an independent journalism organization and not affiliated with Kaiser Permanente. Children registering for school in Florida this year were asked to reveal some history about their mental health. The new requirement is part of a law that was pushed through the state legislature after the high school shooting in Parkland, Fla., earlier this year. Julio Ochoa from member station WUSF reports. JULIO OCHOA, BYLINE: It was one sentence in a 105-page school safety bill. Has your child ever been referred for mental health services? The question troubles Palm Beach County parent Laura Goodhue. LAURA GOODHUE: If you do say, yes, my child has seen a counselor or therapist or psychologist, what does the school then do with that, I think, was my biggest flag. And I actually shared the story with a couple of friends, mom friends of mine and said, can you believe this is a thing? OCHOA: Goodhue has a 9-year-old on the autism spectrum, and her 10-year-old has seen a psychologist. If her children's mental health history is part of their school records, Goodhue worries that it could be held against them. GOODHUE: You know, if my child was on the playground and, you know, something happened, they might think, oh, well, this child has seen mental health services, this must mean something more than what it really means. OCHOA: The question was largely overlooked until parents started filling out school registration forms this summer. Other parts of the law got more attention. One part raises the minimum age to buy a gun, and another allows more school employees to carry firearms. Alisa LaPolt is the Florida director for the National Alliance on Mental Illness. She says parents worry that the information could fall into the wrong hands and may follow children throughout their education. ALISA LAPOLT: In a perfect world, getting treatment for mental health challenges would be no different than getting medical treatment for a skin rash or a bad cold or a broken leg. But that's not the world we live in right now. There is stigma around mental illness and getting treatment for it. OCHOA: School districts say counselors will use the information to help Florida students get the services they need. Some districts will only share the information with psychologists and administrators. Others say they will provide access to teachers and front office staff as well. School counselors, like Michael Cowley of Pinellas County, say they understand the stigma and how the law was written doesn't help. The mental health question was grouped with requirements to report arrests or expulsions. MICHAEL COWLEY: I can certainly understand parents having a reaction when they see those questions sort of asked back to back. OCHOA: But in order to help students, Cowley says school officials must first determine who needs mental health services. COWLEY: The process we're trying to develop and everything we're trying to do is just with an eye towards reducing stigma, increasing awareness and getting students and families access to more care. OCHOA: And the law provides nearly $70 million to increase access to mental health services and schools. National experts say the money is long overdue. Ron Honberg oversees policy for the National Alliance on Mental Illness. He says Florida has historically been among the worst at providing money for mental health care. RON HONBERG: We know that the symptoms of mental health conditions and serious mental illnesses, in particular, they tend to surface during the teen years and early 20s. And that's a time when we should be putting the most resources into interventions. OCHOA: In Broward County, where Parkland is located, the district is using part of the $6 million it received to hire 50 staff members, many of them counselors, psychologists and social workers. Their ability to reach students in need could depend on whether parents feel comfortable checking yes on a registration form. For NPR, I'm Julio Ochoa in Tampa. Transcript provided by NPR, Copyright NPR.